What to do and see in Toledo? World Heritage City Toledo was once the capital city of Spain, and it still retains the atmosphere and aura which are characteristic of so many European capital cities. Toledo is a magic place, probably one of the most spectacular cities in the world. The buildings and winding streets contained within the old city walls hold hundreds of years of history, and the River Tajo which runs alongside the city walls adds to its charm and beauty. A day trip to Toledo is included in the itinerary of most holidaymakers in Madrid, so inevitably the streets and monuments are often packed with national and international tourists. If you want to avoid the crowds, try visiting Toledo mid-week during the low-season months. The city has a long tradition of catering for tourists and has an ample selection of hotels and restaurants, as well as the inevitable gift and souvineer shops spilling out onto the streets. The province of Toledo offers the visitor a wide choice of possibilities. Very cold in the Winter months and very hot in the Summer, the local economy mainly relies on tourism, wine-making and farming. Some areas of Toledo province are famous for producing high-quality pottery and others still make high-quality furniture. Other characteristic Toledan products include swords and other weapons and lace and embroidered materials. During the 13th century Toledo became one of the few places in Spain where Moors, Christians and Jews managed to live together and tolerate eachother more or less peacefully (although not as idyllicly as some history accounts would have us believe), and the singular combination of styles and cultures which resulted from this period in Toeldo's history is one of the city's unique characteristics. Visitors can still admire the remains of churches, mosques and sinagogues built during this time. Toledo became a fortified city under Roman occupation - its location and the River Tajo made it an ideal fortress, and from that moment on the city became one of Spain's most important political, economic and cultural centres. The Visigods named Toledo their capital, and it retained its importance under Arab occupation. When the Spanish armies regained control of the city, it became the official residence to the Spanish Kings and Queens until the 16th Century. The best way to start a visit to Toledo is to park outside the city walls (there are plenty of carparks), get a map in the tourist information center just opposite the Puerta de Bisagra, and enter the old city through this majestic stone gate. It is possible to visit all the main attractions within the walled city on foot and even though you can't do them justice in such a short time, it is perfectly feasible to get round them all in one day. If you have more than a day, use the first few hours to walk around, get a feeling o f the place, enjoy the winding streets seeped in history and culture, and get familiar with the names of places and monuments before actually entering inside. 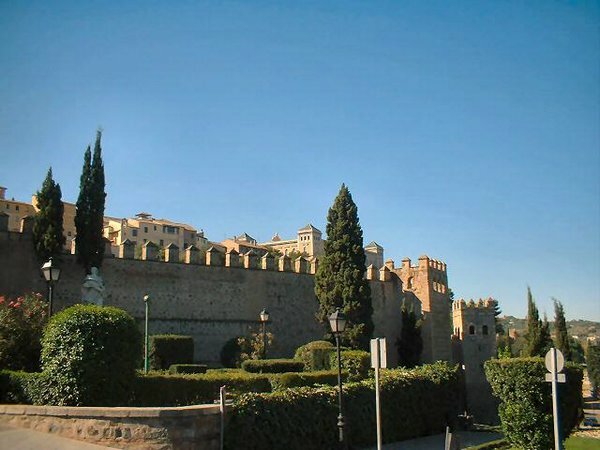 Alcázar: This outstanding castle is one of Toledo's most emblematic monuments and was used as a fortress by Romans, Visigods, Arabs and Christians. King Alfonso VI built his residence here and some of Spain's most prestigious artists and architects intervened in the construction of the royal palace. It was destroyed in the 18th century during the War of Succession, reconstructed only to be badly damaged a few years later in a fire and rebuilt yet again. The last time the palace was destroyed was during the outbreak of the Spanish Civil War and it was repaired when the War ended. Cathedral of Toledo: Founded in the 1st Century by San Eugenio, the first Bishop of Toledo. It was changed into a mosque by the Arabs during Moorish occupation of Spain, and then converted back into a cathedral by Alfonso VI. In the 13th Century it was destroyed and the impressive Gothic building which can be seen today was built on the old cathedral's foundations. Monastery of San Juan de los Reyes: 15th century monastery, Gothic style which was built on Royal demand during the reign of the Catholic King and Queen. Puerta Bisagra: The main entrance to the old City of Toledo. 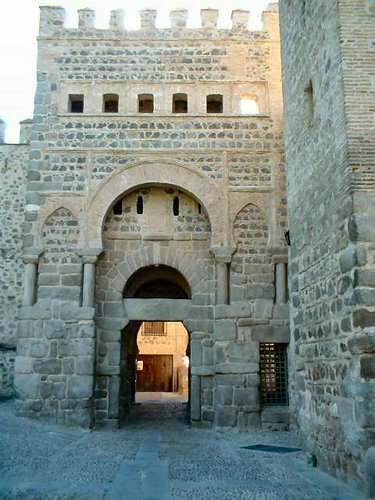 What appears to be one amazing stone gateway is infact two: the old gate which was built during the Moorish occupation of Toledo in the 6th and 7th centuries, and the new gate which extended the original and was built in the 16th century. This is the best way to start a visit to Toledo since there is ample car parking space on both sides of the Puerta and a very good Tourist Info just opposite on the other side of the main road. Sinagogue El Tránsito: 13th century sinagogue with a museum inside which describes the history of the Jewish population in Toledo and the influence the Jews had on local culture and events. Sinagogue of Saint María la Blanca: Today this former sinagogue is a crafts museum with interesting pottery and wooden exhibits. Taller del Moro: Built in the 14th century by the Jews and, when they were expelled from Toledo, converted by a religous order into a church. The original Hebrew writings on the upper walls can still be seen today. Museum of El Greco: The famous Spanish painter El Greco lived in this house which today has an impressive exhibition of his paintings, awell as exhibits of other artists. Museum of Santa Cruz: 16th century building that used to be a hospital. Lovely patio and stairway. Exhibits works of art, tapestries and artefacts found in archeogical excavations. 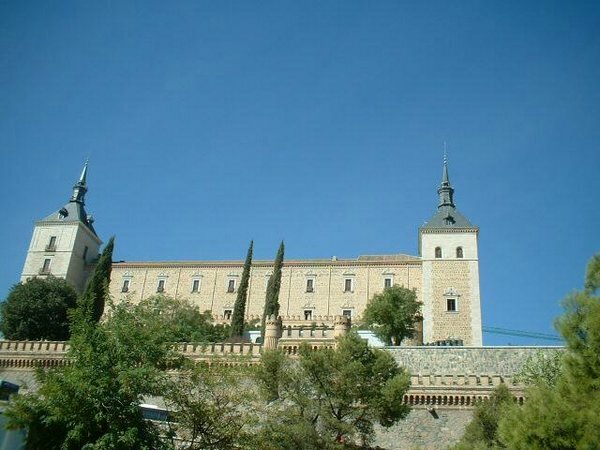 Museum of the Fundación Duque de Lerma: Also known as Hospital de Tavera because Cardinal Tavera ordered it to be built in the fifteen hundreds. There is a statue of Tavera under the dome of the church. Museum de los Concilios y Cultura Visigoda: with exhibits from the Visigod period, set in the church San Román. Museum of Victorio Macho: What used to be the home of Macho, a famous sculptor, is now a museum containing some of his best known sculptures. Fiestas in Toledo: The Corpus Christi celebrations held in Toledo are famous all over Spain. As in most of Castilla la Mancha, Toledo also takes its Easter Week processions very seriously indeed. And the local fiestas are held form 15th to 20th August. What to buy in Toledo: There are lots of souvenir shops in Toledo, and they all seem to have the same stock on offer: swords (for centuries Toledo has been renowned for the steel blades made for knives and swords), walking sticks, models of Don Quijote, painted tiles, copies of El Greco paintings, local wines and liquors and pieces of lace and embroidered cloths and other local crafts. If you want to buy local produce, try Toledan marzipan, excellent local cheeses (different versions of the popular Manchego cheese are made throughout the Province of Toledo) and hams. Where to stay in Toledo: Click on hotels in Toledo for a description of the best hotels in Toledo. Toledo is a very diverse province with flat plains, tall mountains and sierras, rivers, hunting reserves and some lovely small towns and villages. Oropesa: Beautiful Medieval village which retains all its rural and historical charm. The Parador of Oropesa was one of the first parador hotels to open in Spain, and is a lovely renovated 16th century house. With just over 2000 inhabitants, and several 16th and 17th century buildings of interest, it is possible to walk around the village in a couple of hours. Lagartera: This curious village just 2 km from Oropesa is famous for its women who produce vast amounts of embroidered cloths, aprons, sheets, curtains, tablecloths..... On fine days you can see groups of women sitting together and embroidering as they chat in patios or even on the street. Talavera de la Reina: 76km from Toledo set on the banks of the River Tajo, Talavera is the largest city in the province in terms of population. Famous for its pottery and tiles. Some interesting monuments and churches, and an amazing 15th century bridge, Puente de Santa Catalina, with 35 arches. Tembleque: 55 km. from Toledo, this beautiful village has two amazing squares, Plaza Mayor and Plaza de la Orden which are joined by an arch and have beautiful galleries. Villacañas: Small town 80km from Toledo with curious underground houses called silos. Impressive 16th century gothic church - Iglesa Parroquial de la Asunción. Los Yébenes: 42 km. from Toledo and set in the Sierra de Los Yébenes. Interesting castle - Castillo de Guadalerzas - built in the 12th century during the reign of Alfonso VII and last restored in the 18th century. 86km from Los Yebenes on the road towards Ciudad Real lies the Cabañeros National Park (Pueblo Nuevo de Bullaque). Guided visits must be booked in advance. Illescas: 35km from Toledo, this small town owes its historical importance to its strategic location between Castilla de la Mancha and Castilla de Leon. The Castilian royals sometimes stayed here, and Francisco I of France was imprisoned here. Some remains of the old wall can still be seen. The main attraction today for most visitors is El Bohío, considered by experts to be the best restaurant in the province of Toledo and one of the best in Spain.